Integrates scientific foundations with clinical relevance to more clearly explain the science and its application to clinical practice. Edited by Christopher D. Hillyer, Leslie E. Silberstein, Paul M. Ness, Kenneth C. Anderson, and John D. Roback. 887 pp, ISBN-13: 978-0-443-06981-9, Philadelphia, Pa, Churchill Livingstone, Elsevier, 2007. Substantial additions have been made in the second edition of this textbook. These are within cellular therapy, component preparation, infectious disease testing, and the basic biology of transfusion therapy. It is the editors’ goal that this textbook remains the definitive source of blood banking and transfusion medicine biology and practice for professionals within these fields. I must admit that this second edition is an impressive textbook. In a comprehensive way it is parted into two well-balanced sections on blood banking and transfusion medicine preceded by a brief history of blood transfusion. The section on blood banking covers all relevant aspects such as immunohematology, donation, legal/regulatory (USA/Canada) issues, standard and specialized blood components including pathogen reduction and inactivation. The section on transfusion medicine is parted into chapters centered around relevant clinical settings, such as the transfusion demanding critical ill patients, patients with various kinds of coagulations defects, pediatric patients and many more. Taken together, all transfusion medical features of the transfusion demanding patients are well covered, including transfusion complications and therapeutic aphereses. Finally, a comprehensive mini section on tissue banking and cellular therapies, including stem cell transplantation, is given. All the chapters are authored and the book edited by leading scientists who are also “operators” in the fields. Scientifically, the chapters are up to date. Obviously, a main focus has been to provide a text that is operational in relation to various practical situations and with appropriate depth of information. There is always a clear clinical orientation, directed to both the blood bank physician and the transfusing physician. The book absolutely combines scientific foundations with today’s most practical approaches. Also, advances in molecular genetics and complicated science are covered with an emphasis on clinical implications for diagnosis and treatment. I especially appreciated the ease by which one can find operational answers to both simple and rather complicated clinical problems. During my reading of the book our hospital received a patient with a life threatening bleeding due to acquired FVIII deficiency. The textbook provided easy accessible and operational information on diagnosis and treatment due to its clinical emphasis. Also, the various kinds of anemias are addressed with a focus on diagnostic and therapeutic options. In general, one is pleased to find the text complete in its coverage of clinical therapeutics, also when looking for educational material. Anesthesiologists, internists, and surgeons will find the basic information on various products and guidelines for their administration valuable. Today's transfusion medicine specialists coordinate many aspects of blood donation, component preparations, and transfusion practices, which encompass important issues within quality assurance, patient care, and cost-effectiveness. Along with the new therapies in the field of interventional hematology such as blood substitutes, hematopoietic growth factors, stem cell transplantation, and cellular therapies there is a growing clinical role for the blood bank physician. 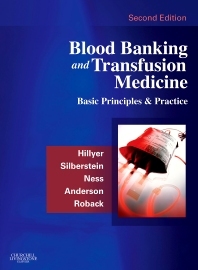 Blood Banking and Transfusion Medicine is a comprehensive, up-to-date, well-written and well-edited textbook. It is very useful for the staff in blood banks, for transfusion medicine specialists and for residents in pathology, hematology and oncology.